After 1 year of planning and design, we have created Tasty Playing Cards. It's a deck inspired by ice cream for magicians and cardists around the world. 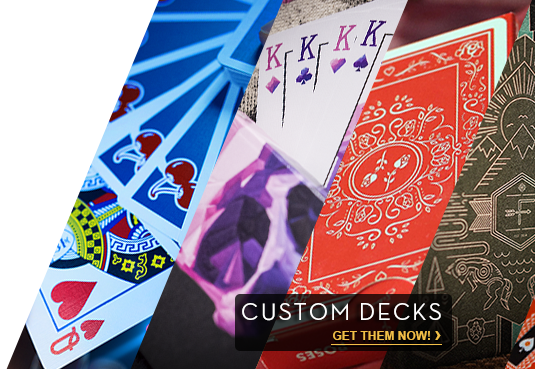 Our design is totally original and limited, we will only print 980 decks and 20 uncut sheets. Never before has a deck been created as delicious as this, with small details and unique colors that look 3D while you make fans and flourishes. No doubt you'll want to try it! This is the first edition of our deck and the strawberry flavor is sure to melt you. Starting from simplicity, we created an Ace of Spades very sweet, with ice cream texture as the back design of the deck. The other aces keep the standard design, but their color is based on their suit -- red cards are pink, and black cards are light brown. We decided to maintain a classic style for the court cards, in contrast with the risky design of the back. In this version, the pips and faces are standard. The color scheme for pips is as noted above -- red cards are pink, and black cards are light brown. The Joker is the most special card in our deck, where you can find our essence. The colors, the textures and the box converge in one place to create something unique and extraordinary. What can we say about our box? It is the first to have an ice cream display that will undoubtedly look very original when taking pictures. Produced by Hanson Chien Production Co.